The first place of worship to be built in Vernon was First Presbyterian Church. It was built through the efforts of the Rev. Paul F. Langill who had arrived in 1890. 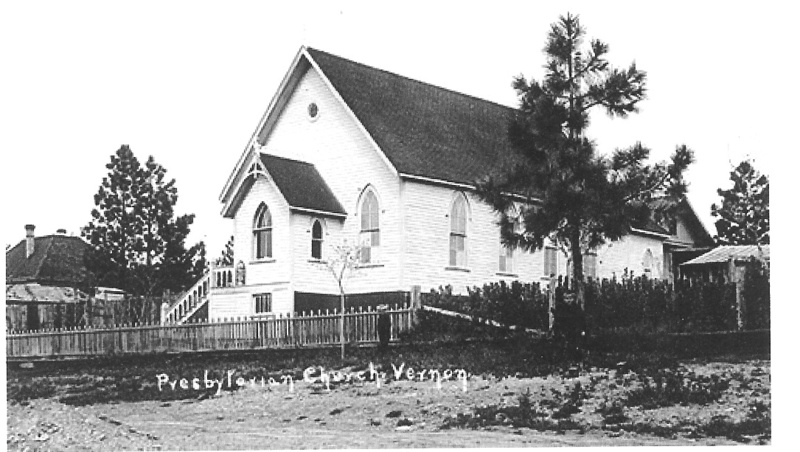 The church was dedicated on Sunday the 21st of February 1892, ten months before Vernon was incorporated. In 1907 the name of the church was changed to St. Andrew’s Presbyterian Church. 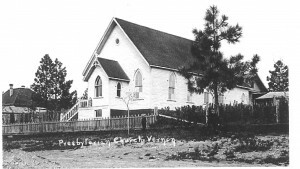 In 1929 the congregation decided to amalgamate with Central United Church, thus ending for a short time the presence of a Presbyterian church in Vernon. In October 1937 the present Knox Presbyterian congregation was formed by the Rev. George Sidney Barber, who at the time also ministered to Armstrong and Salmon Arm. The Rev. Barber conducted Sunday services in the morning at Armstrong, at 3:00 pm in Salmon Arm and at 7:00 pm in Vernon. The Sunday evening services were held in the Scottish Daughters’ Hall until a church was built in 1943 on 28th Street on a site now occupied by Justice Park. In 1962 Knox, Vernon and St. Andrew’s, Armstrong became a self-supporting two-point charge. The two congregations separated into single charges on January 31st, 1981. The church on 28th Street served the congregation until 1971 when the site was purchased by the Provincial Government. A new church was built on Alexis Park Drive but the congregation outgrew that building and built the present larger church beside it. The sanctuary will seat 180 persons and the Fellowship Hall, added in 2002, can accommodate 144 persons seated at tables. It has an unfinished basement.